Small Groups is where our large church gets small. Groups are 6-12 people who meet to discuss faith, go deeper in the weekly message, and support one another in their relationship with Christ. This is the place to care for others and be cared for; a place to impact our community and the world. Small Groups are a great place to explore, ask questions, and grow. Whether it’s through message discussion, serving together, or sharing a common interest, we encourage everyone to join a Small Group and begin growing in their relationship with God. Watch your faith grow through investing in relationships with people who want to learn and grow with you. 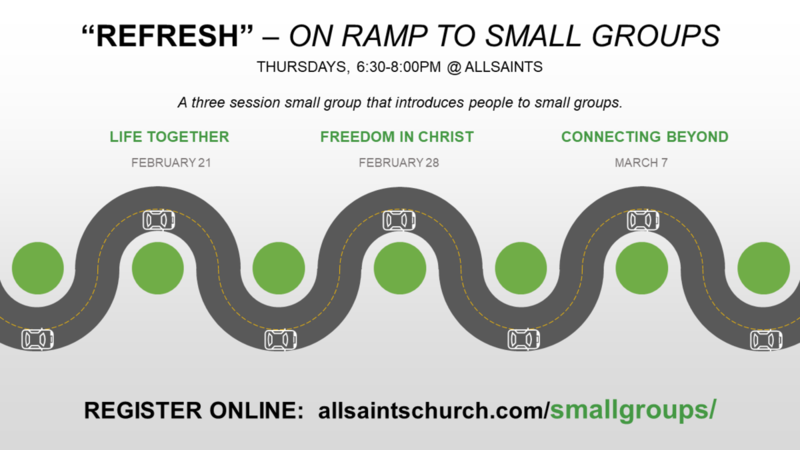 Looking for an on ramp to small groups? REFRESH is for you!